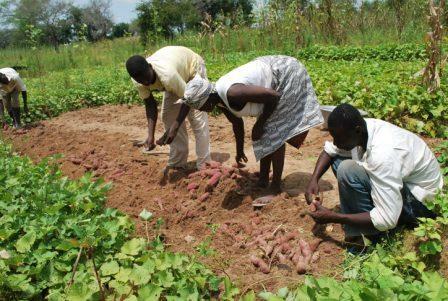 A Kenyan youth in the coastal Tana River County has ventured into farming to earn a living and also further his education. Hiribae Dulu, 35-year-old graduate has been farming for the last five years growing cassava, maize, water melon, sweet potatoes, green grams and kale and using the proceeds to further his education. “My father died when I was a young boy and my mother lacked money to enable me acquire education like my age mates,” Dulu told Xinhua on Wednesday. Dulu who hails from Idsowe in the coastal region has managed to acquire a diploma and a degree in business management from his farming activity. Coming at a time when African governments are being urged to support youths to take up farming as a career, Dulu’s passion in farming has made him the talk of the county and the region at large. The fact that his family lacks land of its own has not stopped him from achieving his goal as he relies on leasing land for free from family members. “I am lucky that an extended relative has allowed me to use his land free of charge, a gesture that has motivated me,” Dulu said. He however attributes his success to support from the Food and Agriculture of the United Nations (FAO) that gave him certified planting seeds. “The region is impoverished due to the continued use of recycled traditional seeds that fails to give farmers desired yields,” he observed. Dulu thanked FAO officials for the support and urged the UN food agency to extend support to the needy adding that he does not need support anymore from any development partner. “The government and development partners need to conduct correct mapping and direct support to the youths to help change their lives as majority are currently jobless,” he added. The farmer suggested that the government initiates an institute in every county in Kenya to offer agriculture-based courses to the youth. Dulu, who relies on two employees, has been pumping water using a pump from River Tana to irrigate his six and half acres land. He said that of all his produce, maize fetches good money as buyers prefer green maize as opposed to dry maize. He noted that his farming is however faced with challenges such as invasion by Fall Armyworm (FAW), an insect that destroys crop, crickets, birds and hippopotamus. Dulu who is expecting to harvest his two acres of water melon before the end of February is planning to register as a Masters student for Business Administration course in September with the proceeds from the sale. “My ultimate goal is to acquire the highest level of education from the money that I earn from farming,” he added.